February was an exciting month for us! We had nearly a week of wonderful, spring like 60s and 70s weather and the kids were outside for hours a day. It also rained quite a bit which showed us some areas where we need to make improvement in drainage. We have a low area that’s downhill from the house and the barn that we call our lower garden that drains poorly. 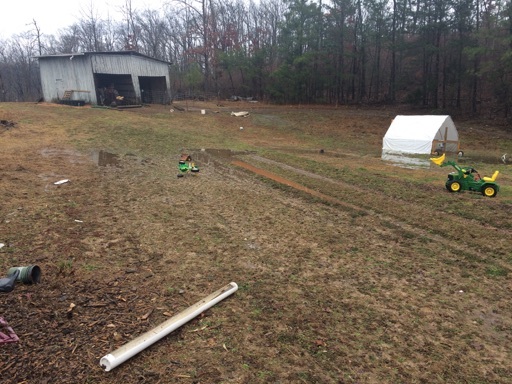 It rained fairly heavily throughout the night in early February and we woke up to a lot of standing water and our chicken tractor was in right in the middle of it. They are smart and all 3 were up on the feeder which is where they like to roost so they were dry and healthy. 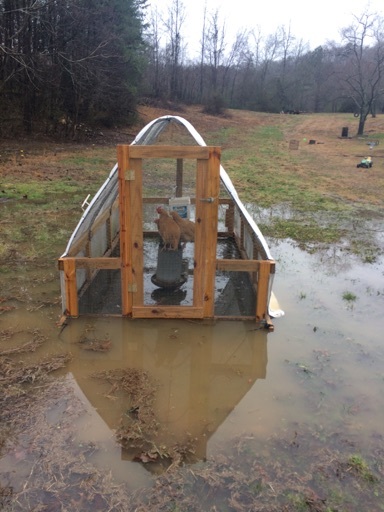 I moved the tractor to dry land and we learned that it may be best to not run the chicken tractor in some areas so this won’t happen again. 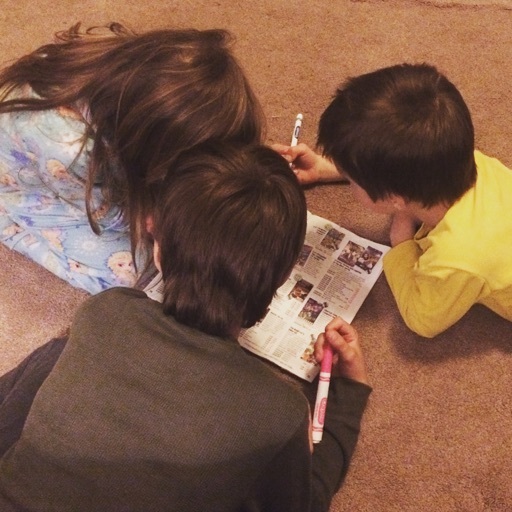 These 3 love books and they enjoyed looking through a Christian Book kids catalog one rainy day. They even color coded the things they circled. Cecilia was pink, Weston was blue and Paxton was green. I love the little organizational skills that are emerging. 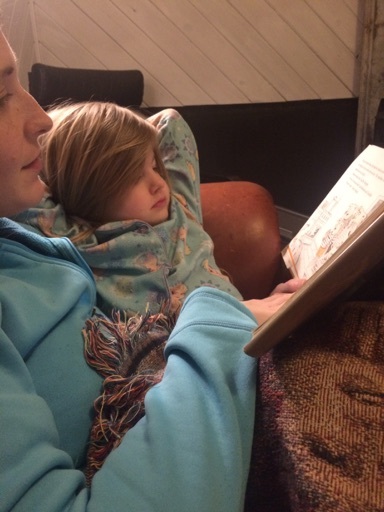 We spend a lot of time reading both for homeschooling lessons as well as just for fun. It’s one of my favorite ways to pass cold, rainy days! The Good Life by Scott and Helen Nearing. The Nearings were homesteaders who lived a very simple, sustainable and self-sufficient life. 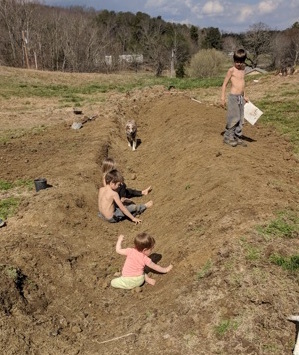 It was interesting reading their story about their two different homesteads – the first in Vermont and the second in Maine which still operates as The Good Life Center even thought the Nearings have both passed. 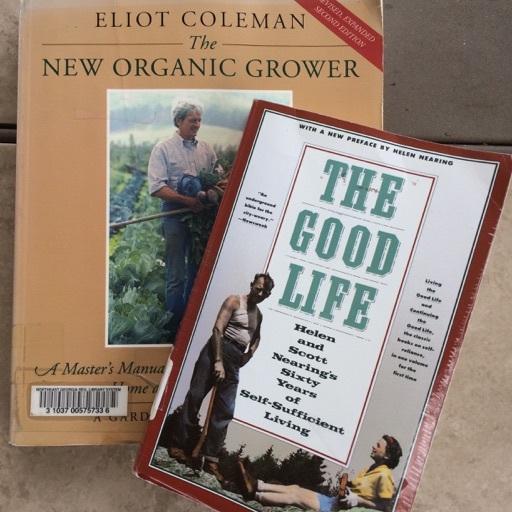 The New Organic Grower by Eliot Coleman is a wealth of information. It’s like a text book for organic gardening. It’s one of those I may end up purchasing for our home library. Both of these were checked out from the library thanks to Georgia’s interlibrary loan system. I am so thankful for the public library and that I can easily access so many wonderful books from across the state. 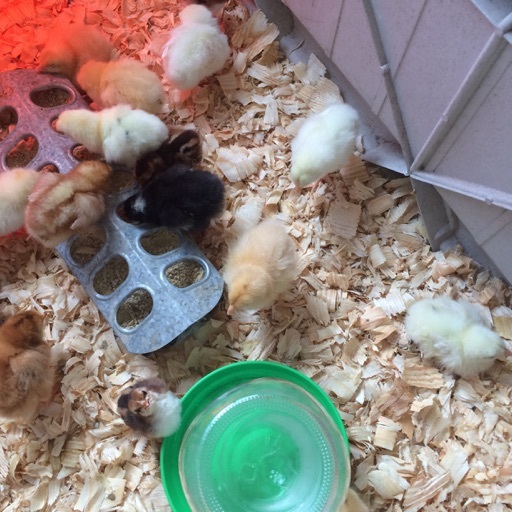 On February 22nd, we bought baby chicks at Tractor Supply’s Chick Days. Weston has been eagerly anticipating chick days. The kids and I picked out various breeds. I have 6 California White, Cecilia has 2 Bantams, Paxton has 3 Production Reds and Weston got 2 Bantams, 3 Golden Comets, 2 Barred Rock and 1 ISA Brown. One of Weston’s bantams died within hours of bringing him home so I think he was unwell when purchased or was injured while being transported home. It was sad but I had reminded all of them before we bought the chicks that they all may not live because sometimes things happen when raising baby animals. He was sad but not heartbroken. We spent the last weekend in February outside because it was beautiful. 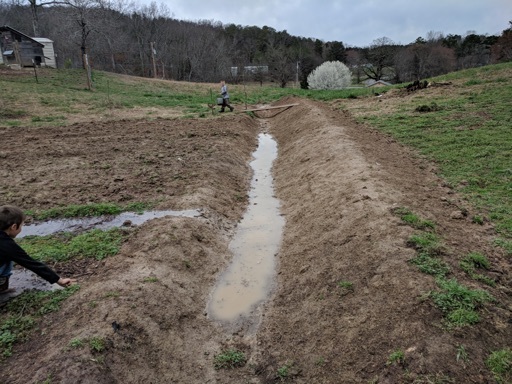 John David plowed a swale for drainage at the end of the lower garden where the water tends to accumulate to help the water drain out of the garden. 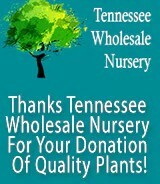 We have plans to plant flowers and vegetables on the swale. The kids loved the swale. They pretended it was a half pipe for snowboarding (they were very inspired by the Winter Olympics). Laura had fun playing in the soil. They all were covered in dirt but they had a blast. 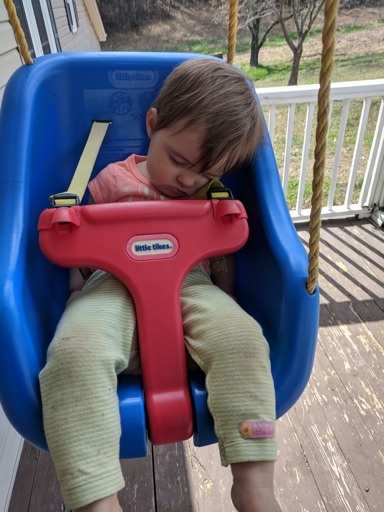 Laura took a little afternoon nap in her porch swing after playing in the soil. So sweet! It rained pretty heavily February 25th so we were able to see how our swale helped the area. There was less standing water in the areas that normally flood. It hasn’t completely solved the problem, we think we need to expand it more on the drainage end but it was a step in the right direction. 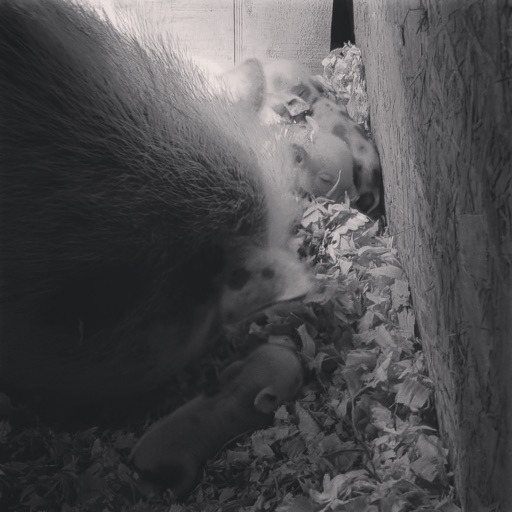 February 26th was a very exciting day – we had piglets born. Clover had 5 babies (2 didn’t survive the night) but we’re thrilled with 3 healthy, happy little piglets. She’s a good little mama to these sweet babies. Mama Clover and her babies. We have 2 boys and 1 girl. 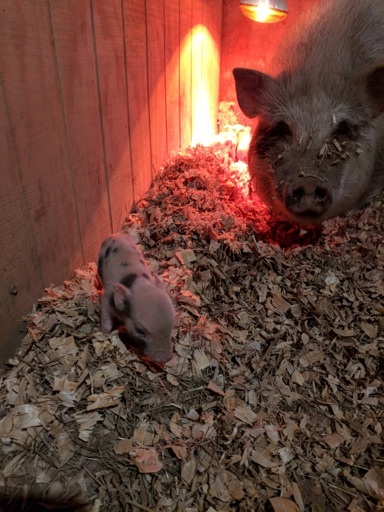 The boys names are Deer and Pink Pig and the girl is Twitch. Cecilia named Pink Pig which is why it’s such a girly name for a boy. We’re looking forward to what March holds – the beginning of spring and gardening especially! 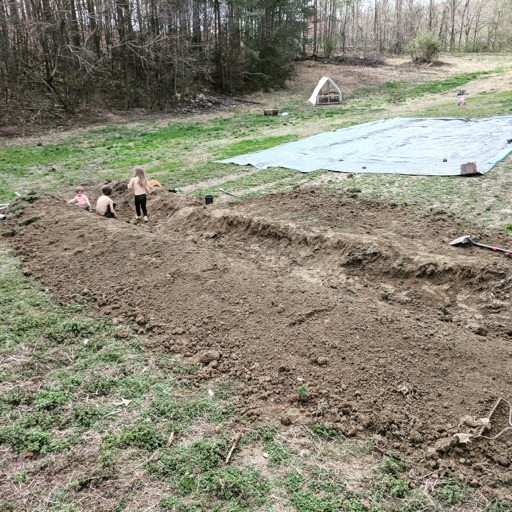 I am excited that you all have your homestead and enjoyed reading about your progress. It’s fun to see how the kids are so involved! I am finally caught up on the homestead! So glad to see you both living the dream. Everything looks fantastic! Much love to you and your beautiful family.